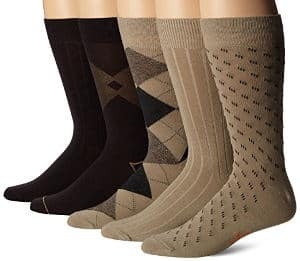 Whether you dress in a suit or simply wear nice dress pants and a shirt for work, then you want to find dress socks that are keeping with business or dress casual wear. So, here is a look at some of the very best dress socks for men. 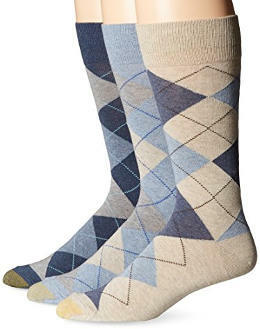 These dress Argyle socks come in size 11-13 (shoe size 6-12.) They are made from a cotton, polyester and elastane blend with a mix of Argyle, solid and ribbed designs. They are mid-calf length and work well under both dress and casual pants. They do not fall down. Thinner than what some people would like. 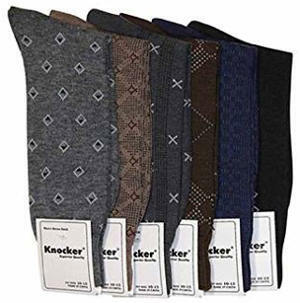 These Knocker socks are size 11-13 (shoe size 6-12) and made from 100% polyester material. They come in a variety of colors all of which match most of the outfits men choose to wear. 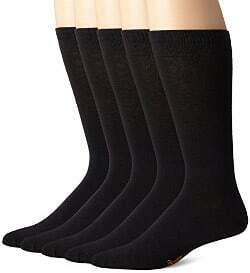 They are also a nice thickness for dress socks as well as reasonably priced. They are comfortable and fit well. Very low priced dress socks. They feel a bit tight for some users. They are made of a synthetic material which does not wick away moisture and can therefore trigger a bad smell. These Easton Marlowe patterned dress socks come in your choice of a 3 or 6 pack. They are European quality and made from combed cotton. They are available in neutral colors with bright accents and bold stripes, and they are incredibly soft. Great colors that remain vibrant after several washings. Very comfortable dress socks and soft with a silky feeling. Thinner that what some people would prefer. These Dockers dress socks come in sizes 10-13 (shoe size 6-12) and are made from a polyester, cotton, spandex and nylon blend. All socks of the pack come in black and are lightweight, breathable, comfortable and soft. They are also machine washable. Fit well and are easy to put on. Do not stretch or lose shape after washing. 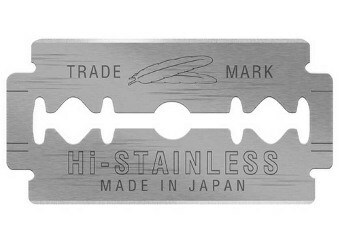 A little thinner than what some users would like. Feel a bit snug for men with thicker ankles and calves. 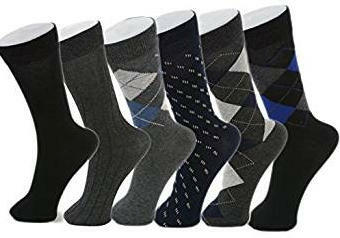 These Dockers dress argyle crew socks come in sizes 10-13 (shoe size 6-12) and are made from a blend of polyester, cotton, spandex and nylon. 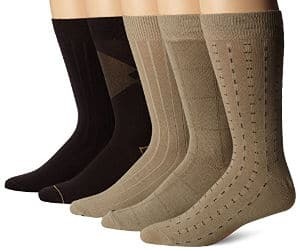 You get 5 pairs of these socks and your choice of black, Khaki assortment and navy. 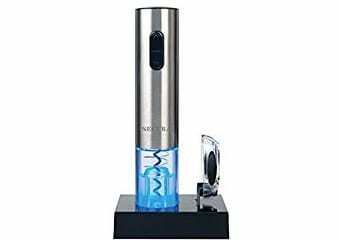 In addition, they are of good quality and machine washable. Great design and style socks. Soft and great for work. Stay up the calf well. Hold up fine after washing. They may feel a bit tight for people with big calves. These Docker’s Dress Dobby Crew Socks come in size 10-13 and your choice of colors between black, navy, and Khaki assortment. They are made from a cotton, polyester, nylon and spandex blend. In addition, they have ribbed stay up cuffs and are machine washable. Fit really well and are comfortable to wear. Come in nice assorted patterns. 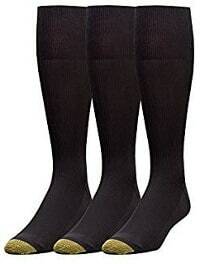 For some people with big calves, these socks are short and roll down. Some users also have their doubts about how durable these socks will prove to be. 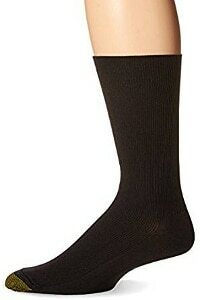 These men’s cotton dress socks come in a package of 12 and sizes of 10-13. Colors include black, geo, multi and striped. They are made from a cotton, polyester and elastic blend, can be machine washed and tumbled dry. 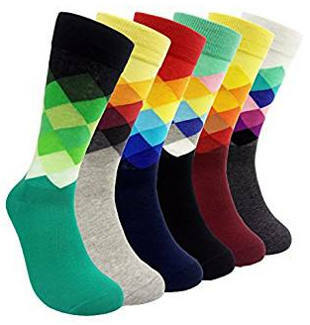 12 pairs of socks at a very low price. Fit well and are comfy. 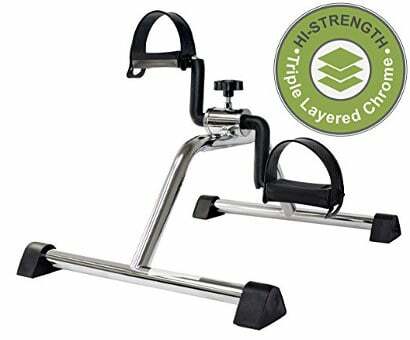 Although the quality seems to be better than what people have expected, some users review that their durability is questionable. Nevertheless, the price is a factor that cannot be overlooked. May be tight for men with large calves. James Fiallo patterned dress socks come in several choices of bright loud colors and are size 10-13. Each of the 12 pairs of socks in this pack are a different style. They are also a good fit as well as soft, stretchable and perfect for dress or casual wear. 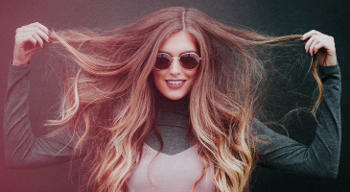 Fun and lively colors and styles. They match with various clothing colors. Extra bonus: Getting compliments for your socks. Some users feel that the material will not last long. May be a bit thin for some people´s taste. These Gold Toe dress socks are made from a nylon and spandex blend. They come in your choice of colors between black, brown, navy and charcoal goal, and they have a reinforced toe and heel. They are soft as well as comfortable and can also be machine washed. Keep feet cool during summer months. 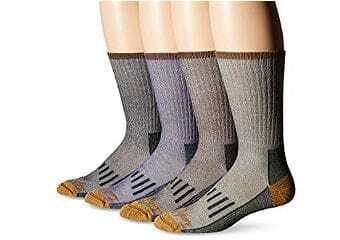 Thin and durable socks which dry out fast. The gold toe works as a distinguishing mark to match socks. Not good for absorbing moisture since they are made of synthetic materials. They can cause sweaty feet if they are worn for long hours. These Dockers dress dashed crew socks come in sizes 10-13 (shoe size 6-12) and your choice of colors between Khaki, black and navy. They are made from a machine washable polyester, cotton, spandex and nylon blend, and have ribbed cuffs. They hold up well, fit good and are of a good quality. 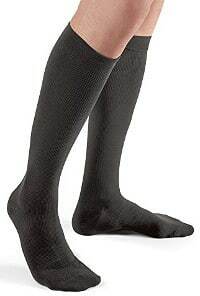 Medium thin socks that are good quality, comfy and very stretchy. Reasonably durable when machine washed. Easy to pair them up after coming out of the washer. Might be a bit lose on slim feet. 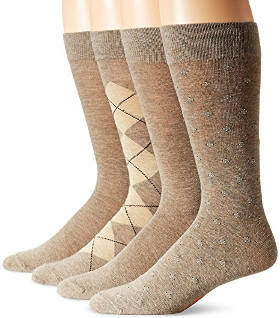 These Gold Toe Men´s Classic Argyle socks are made from a cotton, nylon and spandex blend. They fit shoe size 6-12.5 and have a reinforced heel and toe. They come in a variety of colors and are machine washable. Fit great and hold up very well. 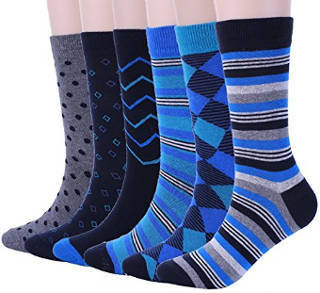 High quality durable Argyle socks that make a nice gift. Offer some additional padding in the heel and toes. Some users find that they go too far up the leg. Made from a polyester, cotton, spandex and nylon blend, these Dockers Argyle Dress Socks are designed to stretch and fit comfortably. They are sized 10-13 and come in your choice of colors between light brown heather assortment, charcoal, or black. They are also machine washable. Good quality and great priced Dockers socks that fit well. Hold up well after washing and drying. The elastic band prevents them from slipping down. May be tight for people whose legs swell or they have extra wide feet. 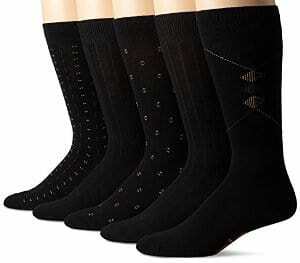 Falari men´s dress socks come in a 6 or 12 pack and are available in diamond shapes, stripes and solid black. They come to the mid-calf and run in size 10-13 (shoe size 6-10.) Made from a cotton, polyester and elastic blend, they can be machine washed and tumble dry. Very nice assortment of vibrant colors. Comfy and stylish argyle socks. Have proven to be not so durable for a few users. 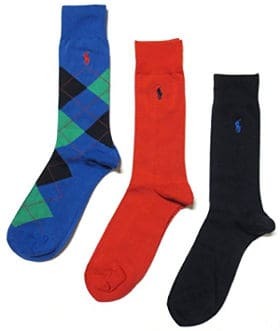 These Polo Ralph Lauren Men’s Argyle socks come in size 10-13 and selected color choices. They are made from a cotton blend and fit well. Have good elasticity and are quite comfy. Great to wear especially during winter. According to few users, they tend to fall down. These Rioriva colorful dress socks come in sizes 10.5-14 as well as several colors and patterns choices. They are ultra-soft and made from a cotton, polyester and spandex blend. In addition, they are calf length and have a reinforced toe and heel. Trendy and stylish dress socks that come in a pretty gift box with a wrapping paper. Comfy, well made and soft, they fit well and do not fall down. Good for business as well as casual purposes that add personality to your outfit. Hold up well and do not shrink. Five pairs in the box with colors that do not fade. Few users found them a bit thin for their needs. 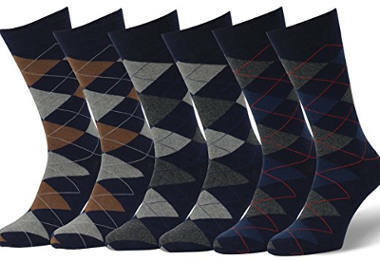 These Argyle long crew socks come in a package of 6 and your choice of various patterns and colors. Made from a polyester, cotton and spandex blend, they are of moderate thickness. They are also machine washable and can be tumble dried. 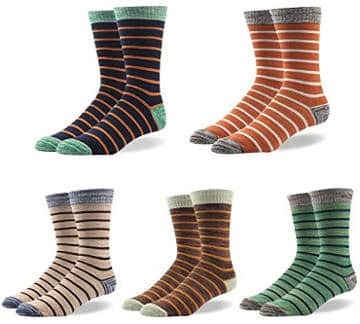 Great bargain socks in beautiful color patterns. Stay up and hold up well. Few people have concluded that the socks may not last long because they are thin, but there were no actual complaints regarding their durability. 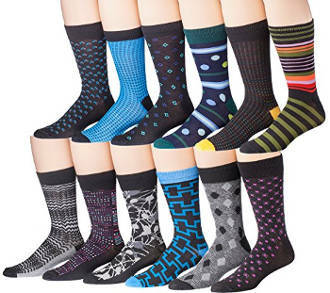 This set of 5 socks come in some really unique attractive patterns as well as colors, and are made from a blend of cotton, nylon and spandex. They fit shoe sizes 5-11. Fashionable socks in vibrant colors. Great Christmas gift for Art students. Fun and comfy to wear. They do not fit larger men’s foot. There have been few complaints about this product’s durability. These lightweight, fade proof and durable Gold Toe socks come in size 10-13. Made from a 98% stretch Nylon and 2% Spandex blend which features an Aqua FX moisture control, they come in a package of 3 pairs and feature a reinforced toe and heel. They are available in black. Stay up well and are comfy and soft. Retain their elasticity and are long lasting. Few people have said that the material is a bit thin for their needs. These Futuro men’s restoring dress socks are moderate compression socks designed to help prevent swelling of feet. 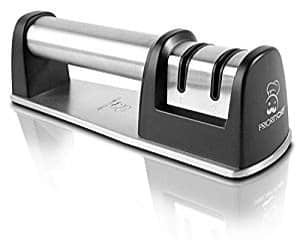 They come in black and relieve leg pain. They have graduated compression, helping improve circulation and massaging your legs while you work. Prevent foot and leg swelling. They are stretchy and hold up well. Comfy with a breathable material. For a few users, these socks are too high. 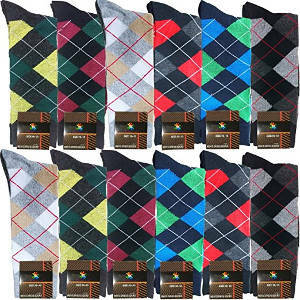 This colourful set of 6 Argyle Dress Socks look very attractive and come in a gift bag package. 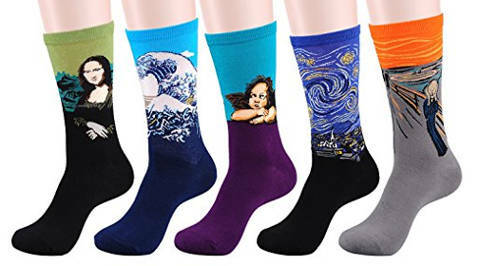 The socks are made of 90% cotton and 10% polyester, and sell for an excellent price. They also come with a 30-day money back guarantee. Colors stay vibrant after many washes. Pliable and soft material that is of a good quality. Fun socks that make a great gift and attract lots of compliments. Few users have mentioned that these socks are thinner than what they would like. 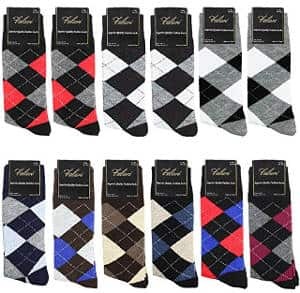 All in all, if you are looking for a good quality stylish pair of dress socks to meet your needs, one of the best dress socks for men in this review should meet your taste and style.